Astro Cat is a video slot game from Lightning Box that is a mix of things that you probably never thought could be combined together. We have an Asian themed slot in front of us with a Hello Kitty charm and just a little hint of Japanese anime. This is just another trip to the Orient that is enhanced with the sound effects that perfectly complement the game. Astro Cat has the Reelfecta reels that we have seen before and we recognize them from the setting of the reels. It is the giant 4×4 square in the center. But if you are new to the gaming world we will explain how it works. It allows you to make a winning line by using one of the 16 symbols once per spin. 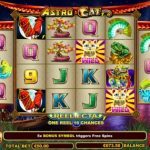 The main feature in Astro Cat is the free spins round. You need to land at least 5 of the firework scatter symbols to receive 12 free spins. During the free spins one position in the Reelfecta Reels will become wild or a poison icon on each spin. The wild symbols will remain locked during the feature and if you are lucky enough to turn the outer edges wild you will receive a mega spin where the whole Reelfecta will become wild. Astro Cat is an entertaining game with a huge potential to pay. The first time we came across this slot we thought that Lightning Box is experimenting something with the theme and the setting of the reels, but it seems that they did that with a purpose. They wanted to keep their players engaged at whole times and give them something they can play on regular basis. The fact that you can win huge is another reason to try this game out. 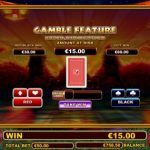 For another great engaging slot you should consider playing Diamond Tower a 5 reel slot by Lightning Box.